5 Card Draw is perhaps the simplest game to learn and has been a popular game played at homes around the kitchen table for years. Often you will find parents playing Five Card Draw with their kids which is a testament to how easy it is to play. Draw Poker is one of the oldest forms of Poker and although you more often find other variants of poker being played today it is still played online and in some casinos. 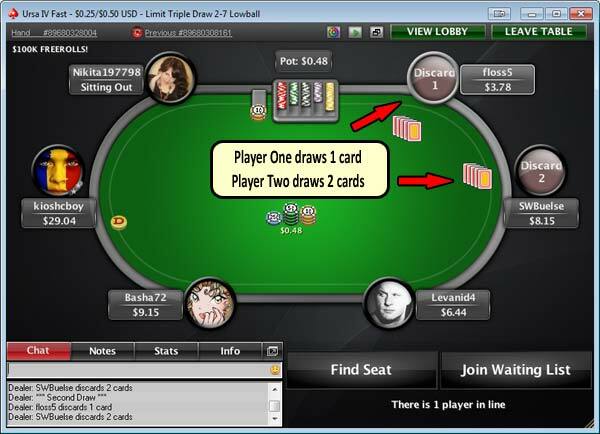 All Draw poker games involve the player being dealt a full hand before any betting commences. The players are then given a chance to replace any or all of the cards they have been dealt during the “drawing” rounds. So… How do you play 5 Card Draw Poker? Each player will receive five cards face down from the dealer which are private to them and only they can see. The objective of the game is to get the best 5 card hand from the high poker hand rankings. For more details on what the order of poker hands are then see our guide to poker hand rankings. During the course of the hand each player in turn will be able to replace any, all or none of their five cards by “drawing” new cards from the deck of unused cards. In 5 Card Draw there is only one drawing round per hand so players only get to swap their cards once. 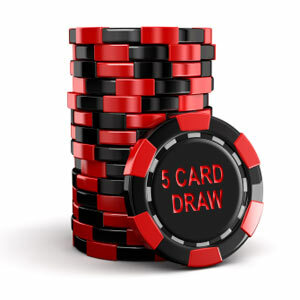 5 Card Draw can be played for a wide variety of stakes and can be played in Fixed Limit, Pot Limit or No Limit formats. For more detail on limits and how this affects the betting rules please read our guide to Poker Stakes & Betting Limits. The Dealer Button is a marker that sits in front of one player and is rotated around the table after each hand is completed so that every player has the button and has a chance to be the theoretical dealer. 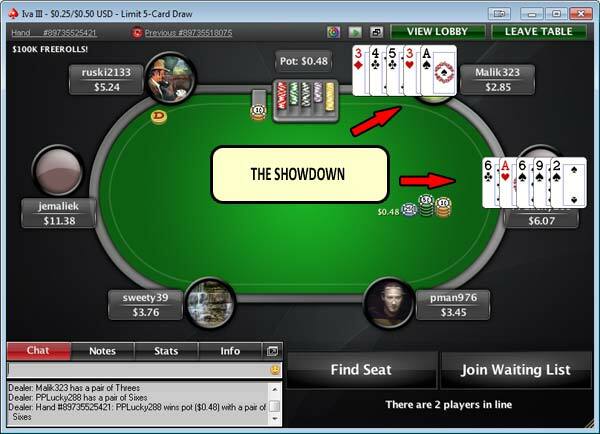 Now that the dealer button has been allocated to a player the two players to the dealer button’s left are forced to place a bet into the pot. This is called a Blind Bet. The player seated first to the left of the dealer button will put in the small blind and the player seated to his left will put in the big blind. The big blind amount is usually approximately double the amount of the small blind. The size of the blinds are determined by the stakes that are being played at the table. The stakes will be described by two numbers, for example $1 / $2. In this example the small blind would be $1 and the big blind would be $2. So the dealer button has been allocated, the blinds have been put into the pot so there is some money to be won, we are now ready to deal the cards. Using the Dealer button as a reference the dealer starts by dealing a card to the player to the left of the dealer button and ends by dealing the last card to the player on the dealer button. Each player will be dealt 5 cards. These are dealt face down and only that player can see what the cards are. All players now have their 5 card hand and they can evaluate how strong their hand is. A round of betting will now take place. During the first round of betting it is the player to the left of the big blind who will act first as the small blind and big blind have already placed a bet into the pot with their blinds. Fold – their cards are discarded into the “muck” pile without putting any chips into the pot and that player takes no further part in the hand. Call – if the player wishes to play the hand then they must call (or raise) the current bet. If nobody has yet raised then the current bet will still be the amount of the big blind. Raise – the last option available to a player is to raise which means that player puts in a higher amount than the big blind or current bet. Once a player raises this then becomes the new current bet and the other players must then call this higher amount if they wish to continue in the hand. This will continue in a clockwise rotation until all players have either folded and eliminated themselves from the hand or put in an equal amount of chips into the pot. Once the first betting round has finished all players who have remained in the hand now take part in the Drawing Round. In the Drawing round, a player is given the option to discard any of his 5 cards and replace them by drawing new cards from the deck of unused cards. A player may choose not to swap any cards (this is called to “stand pat”) or to swap all 5 cards or any number in between. Once all players have drawn their cards then they each know what their final hand will be and the strength of that hand. A final round of betting now takes place starting from the first active player to the left of the dealer button. Each player will have the option to check (not put any chips into the pot) or to bet. If all players check then no further chips have to be put into the pot by any player and we move to the showdown. As soon as a player bets then the option to check is no longer available and the players must either call the bet, raise to a higher amount, or fold their cards. The final betting round has now been completed and we need to decide which player has won the hand. To do this all players that are still active in the hand will reveal their cards and stake their claim to the winners pot. The player with the highest ranking poker hand will be awarded the winners pot. If the hands are tied then the pot will be split equally between all players that are tied. 5 Card Draw Poker is an easy game to learn and is not a bad game to learn as a beginner. It will give you an introduction to some of the terminology and actions involved in a poker hand before you move on to learn some of the more popular and more widely played poker games like Texas Holdem. 5 Card Draw is not as popular as other variants online so you need to ensure that you choose an online poker site that has Draw tables running. If you want to try 5 Card Draw then you should head over to our Play Poker section where we can recommend to you an online poker site that is trusted and also offers Draw Poker games. Practise is the best way to learn, so pick a low value stakes 5 Card Draw table and just experiment until you get used to all the stages above.